Kirkland Hall at Vanderbilt University. When students around the world think about higher education in the United States, a few images are likely to appear in their minds. They probably see beautiful old buildings, libraries full of books and open grassy spaces where students relax or walk to class. A list of famous names probably comes to mind as well; Harvard University, Yale University, Stanford University. The list sometimes stops after just five or six schools. But, there are over 4,000 colleges and universities in the U.S. Why do only a handful of them gain so much attention? One reason is history. Schools like Harvard and Yale have existed for hundreds of years so people have been hearing about them for hundreds of years. Another reason is reputation. Some of the best-known schools, including Harvard and Yale, are part of a small group called the Ivy League. These private American colleges and universities have long been thought to be among the best in the world. 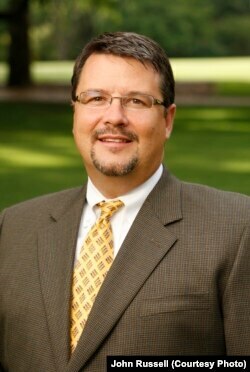 John Gaines, director of undergraduate admissions at Vanderbilt University. John Gaines says such schools earned their reputations. Gaines is the director of undergraduate admissions at Vanderbilt University, a private research university in Nashville, Tennessee. 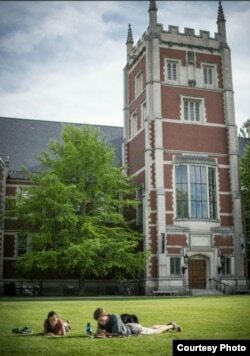 While not part of the Ivy League, Vanderbilt is widely seen as a top American school. Gaines says, for generations, schools like Vanderbilt have produced important leaders and thinkers. But he admits that these famous schools are far from the only places that offer an excellent education. The top schools in America are also extremely difficult to win admission to. For example, about 39,500 undergraduates applied for admission to Harvard for the 2017 school year. The university accepted just a little over 2,000. In 2016, Vanderbilt accepted fewer than 3,500 of the more than 32,000 students who applied. Gaines suggests every student should consider other possibilities in the face of such competition. He says they should look at schools with fewer international applicants or those seeking a more diverse student body. Gaines says applicants who are a little different than most can be especially appealing. Gaines says there are many sources for information on the different types of colleges and universities in the U.S. The U.S. News and World Report and the Princeton Review are some of the most popular sources of this sort of information. The two groups rank and review schools using many kinds of measures. But Gaines says students should make use of the U.S. Department of Education’s College Scorecard. He also suggests the non-profit organization the College Board’s Big Future website. Both services are free, and they let students search for schools based on qualities like location, cost, size, and kind of programs offered. The College Scorecard even lists graduation rates and the average amount of money students make after they graduate. Students relax outside at Bowdoin College. Ryan Ricciardi says looking for information beyond just a ranking can be extremely useful for students. Ricciardi is an admission official at Bowdoin College in Brunswick, Maine. Bowdoin is a private college with about 1,800 total students. The school accepted about 14 percent of its applicants for 2017. School rankings are decided using information like average scores of common tests and size of investments. So Ricciardi argues that more detailed information that directly relates to a student’s individual needs is much more useful. Ricciardi and Gaines both say that students should start their exploration by asking themselves several questions: Do they prefer small classes or big ones? Are close, personal relationships with their professors important to them? Do they want to be in a small town or a big city? The answers will help them narrow the field of possibilities. Ricciardi also says that parents should also understand and accept that not everyone can or will get into a “big name” university. But, she says many successful people have received great educations from lesser known schools. Students walk to class at Bowdoin College in Brunswick, Maine. Pete Musto reported this for VOA Learning English. Caty Weaver was the editor. We want to hear from you. How important is a school’s reputation in regards to the quality of the education it provides? What are some of the experiences you have heard about from other students who have attended lesser-known colleges and universities? Write to us in the Comments Section or on our Facebook page.